You know that feeling you get when you go somewhere and you feel like you’re home? That’s exactly how I felt about last weekend’s Con-GT. Of course, it doesn’t hurt that the con, located in Clarksville, TN, is only a three-hour drive from where I live. Or that my niece only lives about 45 minutes away. But mostly, it’s just that Doctor Who fans, as always, no matter where you go, generally rock. 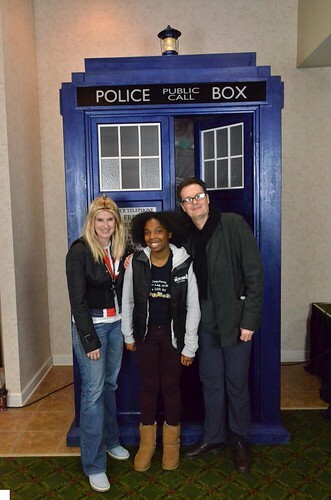 There’s a sense of family when you go to a Doctor Who con that I miss when I attend non-Doctor Who cons. I get that feeling at Gallifrey One and I also get that feeling at Con-GT. Even better? Con-GT had me at their convention as a guest, which makes this my first appearance as a guest at a con. It feels weird, but I have published several books and done quite a bit these past few years, so I suppose I was worthy. I drove to Con-GT last Friday through a lot of back roads and changing speed zones (OMG, PICK A SPEED AND STICK WITH IT, TENNESSEE). I arrived around 4 p.m. at the Riverview Inn in Clarksville, TN, where I promptly ran into Edward Owen, who I like to think of as the man in charge. 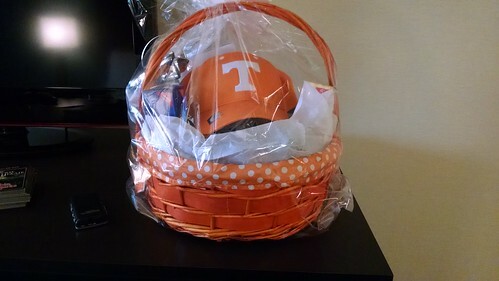 He took me to my room, handed me an awesome gift basket, loaded with lots of Southern treats and wine and I got settled in. Isn’t that lovely? Even if the UT hat makes those people in my town angry (which is why I’ll wear it… heh). I was a little worried I would feel awkward at the VIP party, but it was so much fun that I didn’t want to leave when it was over. 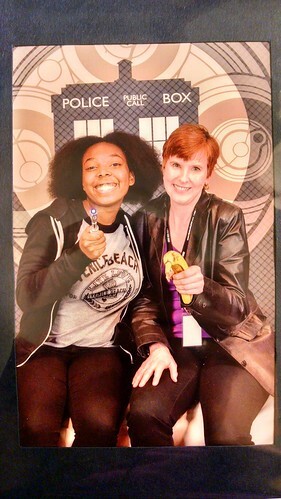 I talked Doctor Who with a lot of folks, and even gave some writing advice (and later got word that my advice was heeded, which was awesome). I also met the other guests (although I met Andrew already at Gallifrey One) and got a photo taken with Ellis, who is just a really great kid. A lovely young lady gave me four boxes of Girl Scout cookies, too, because this is the South, and we are ALL ABOUT THE FOOD. Speaking of which, after the VIP party, we all went out to dinner. Because ‘ya know, you can never eat too much. I was very full when I got back to the hotel that evening, but knew I was in for a very good, and special, time. I was already feeling like I’d come home. Saturday was also a lot of fun. I put on my BioShock Infinite TARDIS dress, which was a hit with just about everyone. I’ve never posed for so many photos in my entire life. We opened the con with an introduction of the three guests, myself included. We also took a selfie with Ellis, because she’s a teenager and teenagers love their selfies. Again, I’m still sort of in awe that I’m sitting up there with Andrew Cartmel and Ellis George, both who’ve probably been inside the real TARDIS. WOO! We opened the con and I went to sit at my table (yes, I got an official table with my name on it and everything). I was a little worried that I’d sit there all alone, but I took a ton of photos, signed autographs on postcards I’d brought to promote my books (which blew my mind) and talked to a lot of people. I even discovered I had fans of my books, those who’d already read the series, asking me about the next one (which should be out this year). It was so wonderful just to meet everyone! I met my niece for lunch, which consisted of me trying Radler for the first time (in honor of my upcoming trip to Germany), and then went back to the con. Honestly, I spent most of Saturday just hanging out with folks and it was so much fun. I hated leaving and missing the dance that night, but I promised my niece I’d spend the night with her. 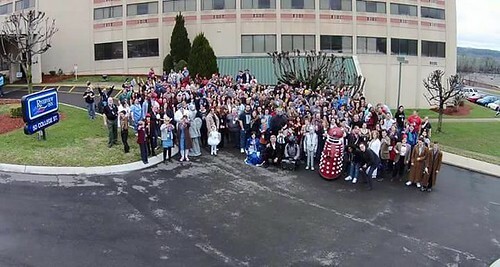 At noon, we got everyone together to do a group shot with a drone. How cool is that? In other news, my niece and I had a wild night. We drank a bottle of wine and passed out at 9:30 p.m. But hey, I was well rested for Sunday at Con-GT. 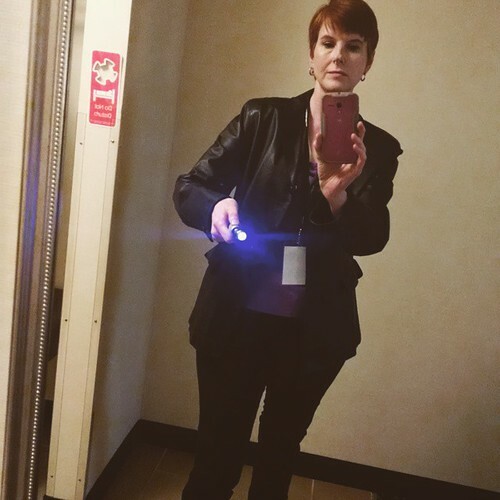 I got up early, dressed as Rose and headed back over to make my first panel, which was about cosplay. The panel went well, and I learned a few new things, too. I feel a little more prepared for that Dragon Age Inquisition Sera costume I’m working on later this year. I sat at my table a little more, hung out a little more, posted for a few more photos. I had another cosplay panel later that day, as well as a panel with Ellis and Andrew where we did a Q&A. 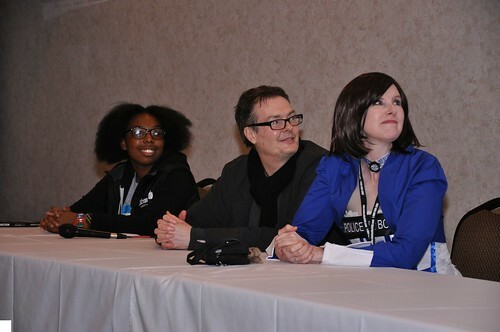 Again, I was nervous that I’d be ignored, but the first question of that panel was FOR ME! Of course, most questions for Ellis, because she was the star of the weekend, but I was really happy that people seemed genuinely interested in what I had to say and asked me a lot of questions about writing. That was pretty awesome. Of course, all good things must come to an end, and soon it was time to say goodbye and drive back home. I definitely felt sad, but I’ve collected an entirely new group of friends and met some fantastic people that it gives me something to look forward to when Con-GT rolls around again next year. And I know that when I return, it will, once more, feel like home. I’d like to thank the entire group of people responsible for making Con-GT happen, as well as everyone who attended. Because I had the best time of my life. See y’all next year! Haven Sneak Peek: Will Lexie Remember Being Audrey?